In a town full of proud Poles and quite a few other ethnicities, sometimes I think my landlord Shannon and I are the only two Micks around. But, as I discovered to my surprise while writing my Hamtramck chapter of Soused and Serene, we’re in good historic company. Grab a Guinness and a whiskey (Paddy’s, natch) and cozy up with me while we talk about one of the most delightfully colorful characters in Detroit’s Prohibition story. Zookeeper. Brothel proprietor. Fiddle player. Philanthropist. Fighter. Patrick J. “Paddy” McGraw arrived in Hamtramck in 1924 with a bang, fresh out of the navy. He set up a sprawling saloon on the south side, at Clay Street where it met the Grand Trunk railroad line. Although he reigned in town for less than a decade, the burly, loudmouthed McGraw–oh, heck, let’s call him Paddy–shaped the destiny of the young town. Here’s what the area looks like now. 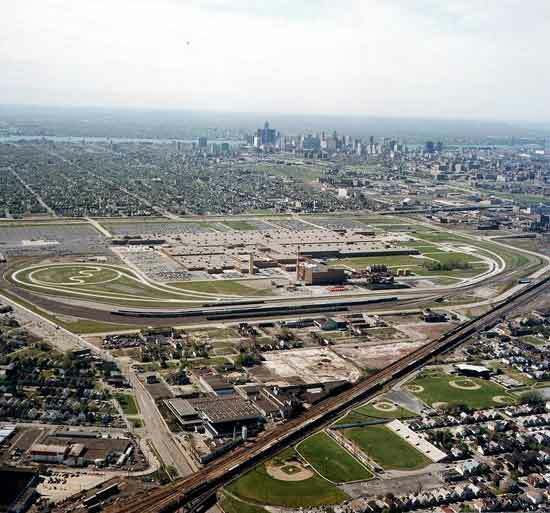 See my comments below on preservation, Poletown, and eminent domain. Paddy’s brothel/saloon was reportedly the biggest in the Midwest, and close as it was to the train tracks and Milwaukee Junction, he never wanted for business. Fellows came in from all over the country, lured by the promise of conviviality and female companionship with speed and style. Paddy employed up to 36 girls per shift. He maximized profits by efficiently shuffling the johns in and out in a hurry. Off the train, grab a pint and a shot, wait your turn on the stairs, a quick how-do-you-do with the lady, and it’s back down to the saloon for a bite to eat before you grab your train back out. But his visitors loved him for his charming friendliness, and Paddy was always there to greet them with a smile and a yarn. Paddy delighted in playing the fiddle to entertain his guests. His old-world Irish hospitality meshed perfectly with the boisterous, rollicking crowd at his joint. He had a soft spot for kids and animals: behind the brothel, he kept a zoo with bears, monkeys, rabbits, and innumerable stray dogs and cats. And he was instrumental in founding the Hamtramck chapter of the Goodfellows Old Newsboys Network, which for over 100 years has worked to ensure “No Kiddie Without a Christmas”. They’re still active, and you can donate here. 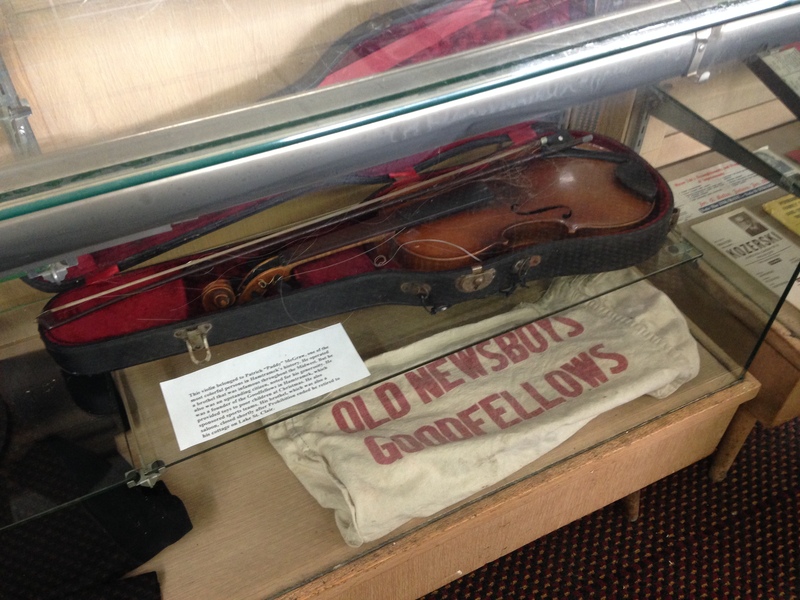 Here’s his violin and an original Newsboys Goodfellows collection bag. At the Hamtramck Historical Museum. You should go there. Once Prohibition ended, the competition was too hot for Paddy, so he closed up shop in 1933 and retired to St. Clair. For three years, nary a peep came from Paddy until his death in 1936. Rumors swirled that his “accident” at home was in fact the result of a wallop with a chair by neighbor John “Sailor Jack” Gillis. Speculation ran that it was…dare I say it…a Paddy Whack. * Once the dust settled and the autopsy report came in, though, turns out Paddy died of a plain old-fashioned heart attack. He was sixty years old. The ruin of Paddy’s brothel gradually decayed until it was torn down as part of the GM Poletown Plant debacle in 1981. Here’s an LA Times article from 1985 recapping the events. I never saw the building before it went down, but I do wish I had. Oh, and if you want more reading on hidden Poletown stuff, read Amy Elliott Bragg on Beth Olem Cemetery. Credit where it’s due!! Greg Kowalski, Hamtramck’s historian, introduced me to Paddy’s legend a couple of years ago. You should read his books, or pick his brain about Hamtramck’s history at the historical museum on Campau. *I had to. I cannot resist a bad pun. What a treat! I’ve been writing abt how prohibition caused the Crash and Depression, and am delighted to find a window on Purple Gang Detroit.